The training begins with an observance of the Lord’s Day, followed by a week-long evaluation and analysis of the biblical principles behind the practices they observed. The participants have a chance to reflect on how the nine marks are applied at CHBC, as well as the pastoral discernment involved in those applications. During the Intensive, the group will meet and interact with various CHBC elders and authors, and even visit a church plant in a different context. The participants will receive books to read prior to the event as well as other resources they’ll discuss throughout. All in all, they’ll participate in over 20 hours of group discussions aimed at practical application. What is the difference between an Intensive and a Weekender? The 9Marks Intensive is the International version of the 9Marks Weekender. It began with the acknowledgment that the church ought not look the same in every nation, even as certain biblical principles remain constant. This extended, language-specific training gives international leaders the experience of a miniature internship in the context of a local church. The primary focus of these nine days is to provide each participant with a biblical philosophy of ministry and a deeper understanding of church membership, church discipline, elders, and corporate worship. We believe the same elements ought to characterize every healthy church across the globe. Adapting these elements to each country and context, however, is a complex task requiring much study and discernment. The goal of the 9Marks Intensive is to provide an environment for such study. We encourage pastors and church leaders to attend because, just as every Timothy needs a Paul, every church needs a model. As Paul writes to the church in Philippi, “Brethren, join in following my example, and observe those who walk according to the pattern you have in us. The things you have learned and received and heard and seen in me, practice these things, and the God of peace will be with you” (Phil 3:17; 4:9). International Intensives take place at Capitol Hill Baptist Church, just five blocks behind the Capitol* in Washington D.C. From the 1950s to the 1990s, this inner-city church experienced a 40-year decline. But in the 25 years since, the steady and faithful preaching of God’s Word has breathed new life and holiness into this local congregation. You’ll hear about the history of the transformation over the course of the Intensive, as well as some of the lessons learned. * We also arrange for a private tour of the U.S. Capitol, as well as time to visit some of the D.C. monuments. Intensives generally occur three times a year: March, May, and September. Registrants are expected to participate in the entire schedule beginning from 6:00 p.m. on Saturday through 12:00 p.m. on the next Monday. Who should attend an Intensive? The Intensive is designed for men who are or aspire to be church leaders. This includes pastors, elders, deacons, lay leaders, seminarians, and more. View a Sample Schedule here. The period begins with an observance of the local CHBC Lord’s Day, followed by a week-long evaluation of the biblical intention behind forms participants have seen practiced. Our intention is not that leaders copy the specific application of these principles, but that they’re challenged to consider more deeply the biblical elements of a healthy church. The event begins with lectures on the biblical and theological framework of the local church. It then transitions to watching how this framework gets implemented in one local church. The group observes the planning of the next Sunday’s service and discusses it together. They also meet and interact with CHBC elders and visit a church plant in a different context. Students sit in on both closed-door and public meetings, as well as additional lectures by church leaders in a variety of ministry areas. Later in the week, they’ll be joined by over 100 English-speaking pastors who arrive for Weekender. This culminates in a second Sunday of worship. On the following Monday morning, the men are encouraged to think practically about what they have learned from the event, and to outline steps for supporting, planting, and building healthy churches in their home countries. Again, it’s not our desire for church leaders to simply “copy” what they see, but for them to explore how biblical elements of healthy church life might be implemented in their cultural contexts. The primary books used during these trainings are What is a Healthy Church?, Church Membership, Church Discipline, and Church Elders. We make every effort to provide these in the native language of the participants. They’re free to take each book home as a gift from 9Marks. View a sample Intensive schedule here. The goal of this course is to couple biblical and theological study with the observance of a healthy local church. As they return to their countries, participants are equipped to think biblically about the forms and habits of their congregations. They’re also challenged to implement the biblical elements of a healthy church where they are. As they do this, their own church members begin to think intentionally about these issues and examine the principles themselves, thus fostering the health and growth of the church. Intensives participants stay as a group in dormitory-style housing close to CHBC. This accommodation is provided by 9Marks to all international pastors and encourages relationships to develop among participants from each group. 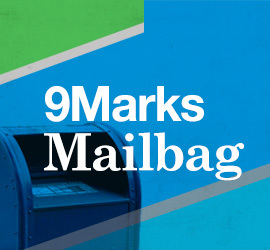 9Marks provides all meals to international pastors with the exception of Saturday afternoon, when participants go out together for free time. You’re responsible for your own travel arrangements to Washington D.C., but we will help coordinate your airport pickup and departure as long as they’re on the scheduled arrival and departure dates for your class. Please plan to arrive at the church no later than 5:30 p.m. Saturday evening. If you’re flying to D.C., it’s advisable to arrive by 3 p.m. at one of three Washington, D.C. area airports: Reagan National (DCA), Dulles International (IAD), or Baltimore/Washington International (BWI). Please do not book your return flight for any earlier than 2 p.m. Monday afternoon. As you’re making travel plans, we strongly encourage you to arrive early or at least on time Saturday evening, and to refrain from leaving early on Monday. All international attendees accepted for the Intensive are responsible for their own airfare and travel costs, but all food, accommodation, and learning material is provided by 9Marks. In light of the greatly reduced cost of travel for domestic participants, we ask them to cover an amount similar to the usual Weekender registration amount. Your application must be submitted by the deadline which corresponds to the specific dates of the event you plan to attend. Applicants aren’t expected to possess visas prior to the date of application, and applications will be reviewed six months before each event to allow sufficient time for visa application and travel arrangements. Each accepted participant will receive an invitation letter providing further information about the event. These classes fill quickly applications for specific events are sometimes declined due to space limitations. Men often ask if they can or should bring their wives to the Intensive. This is not possible as the group stays together in dormitory-style housing. Leave Room in Your Suitcase! Those who attend the Intensive should expect to receive free books from 9Marks, so make sure to leave some extra room in your suitcase! We ask that you apply only if you’re able to attend the whole Intensive. If your application is accepted, please note that it’s conditional upon your full participation in the schedule. For more information and to apply, write Simona Gorton at simona@9marks.org. We will respond to you via email six months before the event for which you applied. Please note, space for these events fills quickly, and sending in an application does not guarantee placement.